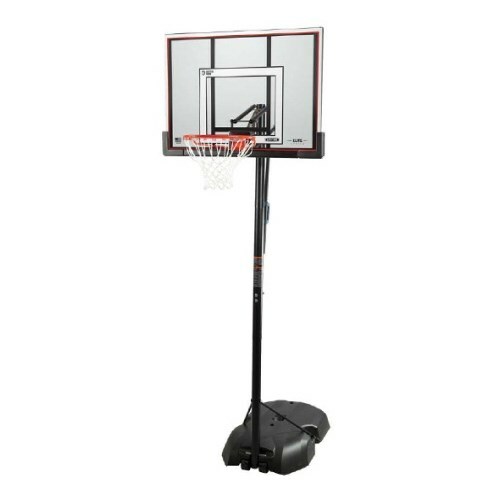 This portableLifetime ProductsBasketball system features a clear view, 50"Shatter-ProofSteel-Framed backboard with a Speed Shift® height adjustment mechanism which adjusts from 8' to 10' high. THe New Clearview Backboard eliminates backboard braces for increased stability and target visibility. Also included is a Slam-It® Rim with an all-weather nylon net and a 3" diameter round steel pole. The 34-gallon portable base makes it so that this system can easily be moved to a desired location. Bring the arena to your home with a residential basketball system from Lifetime Products.A 5-year limited warranty covers this Lifetime Portable Basketball Hoop. Dimensions: 51" x 35" x 10"